Camlar are proud to sponsor Brentwood V Cancer Charity football match for Teenage Cancer Trust on Sunday April 30th. 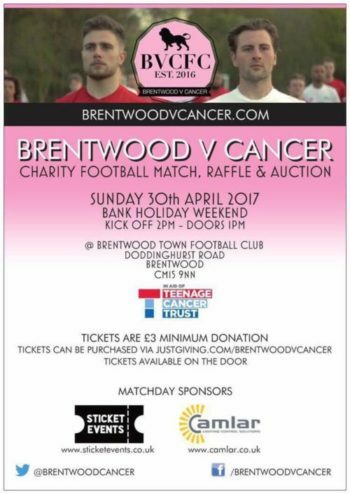 Join us for the second annual Brentwood v Cancer charity football match! After my younger brother Sam was diagnosed with cancer in 2015, I wanted to do something to help those battling the disease and the families who go through it with them. This year we will be raising money for Teenage Cancer Trust. Thanks to the amazing friends, family and community around us, we managed to raise nearly £14,000 collectively. To donate or buy tickets please click here.